Perfect for a new generation of "Alexander and the Terrible, Horrible, No Good, Very Bad Day" readers, this charming story about a grumpy cat gently shows how far a little sharing can go. Bernice is having a truly rotten time at her friend's birthday party. First, everyone else gets a piece of cake with a frosting rose. But not Bernice. Then, everyone else gets strawberry-melon soda. Bernice gets the prune-grapefruit juice. And it's warm. The last straw is the one lousy (squished) candy she gets from the piñata. 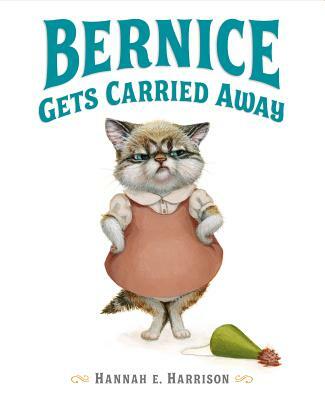 So when the balloons arrive, Bernice knows just what she has to do: grab them all. And then, poor cross Bernice gets carried up, up, and away. Luckily, she figures out just how to make her way back down to the party...and she brightens lots of other animals' days on her way. Hannah Harrison's gorgeous animal paintings come alive in her second picture book.